Starting on Mother’s day our family began a new cooking transition. Sundays have officially become Bollywood movie and Indian supper night at our house. While kids groove to some Indian beats, Arjun and I throw together a few dishes. In addition to having a delicious dinner on Sunday, it saves the start of the week because we make enough that leftovers are served Monday night. The start of the week is crazy enough without worrying about cooking dinner so this is a win-win. 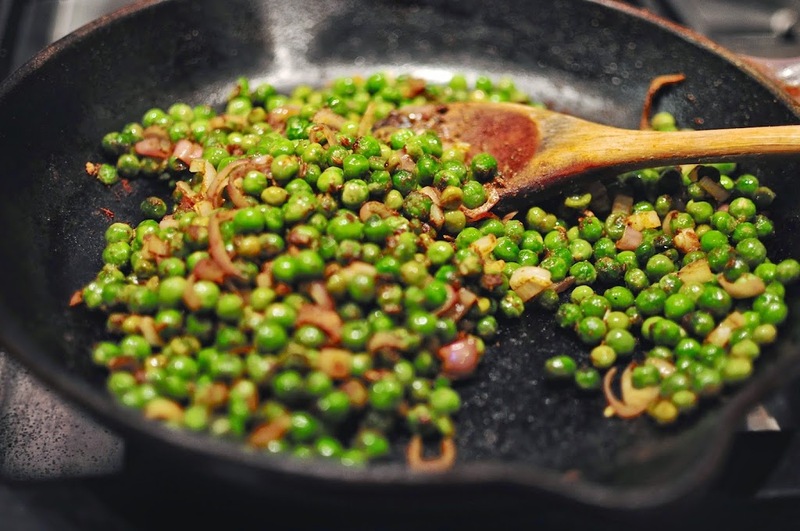 One of the vegetables I’ve been making on regular rotation for Sunday Desi Supper is mattar pyaaz or literally translated, peas and onions. I know – that underwhelming name is not going to get you motivated to make this dish. But you should!! It comes together in 15 minutes and has such a tangy, addictive flavor thanks to the aamchur (dried mango powder.) I made it once and then literally couldn’t stop making it because I was hooked on the spice profile. Generally speaking I almost exclusively cook with frozen peas. But I noticed fresh peas being sold in the refrigerated case at Trader Joe’s this spring and gave them a whirl in this dish. The texture was a a notch above frozen peas which can often go to mushy very quickly. If you can get your hands on some fresh peas I would certainly try them here. 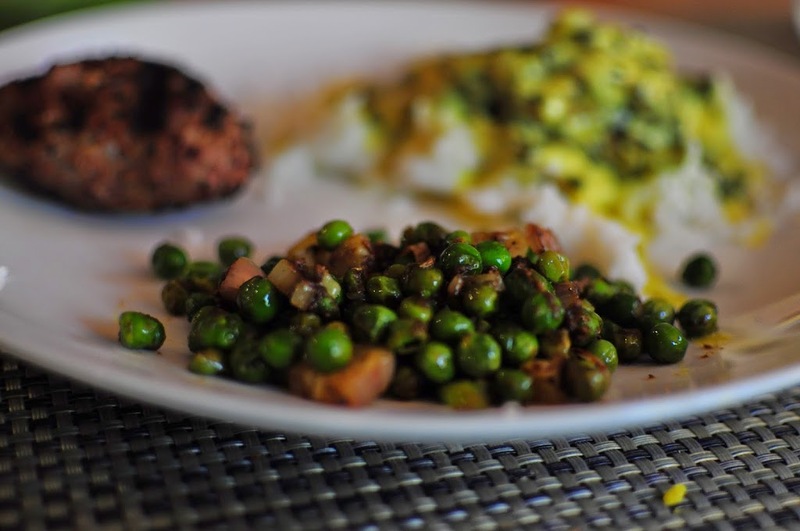 An added bonus is that my kids like peas – they treat them like a fun finger food. So not only am I a happy cook, I’m also a happy mommy. These two things often don’t intersect and may be another reason why I keep making this dish! Kids or not, palates of all ages will enjoy this veggie side. 1. Heat the oil until it shimmers over medium heat. 2. Add the crushed fennel seeds and let them sizzles for a minute or so. Then add the ground coriander, chile flakes if you are using and turmeric. 3. Add the peas and stir so all the spices are integrated. Cover and cook the peas for about 3 minutes. You don’t want to overcook them – they will go from plump and juicy to shriveled and dry so watch and taste. 4. Add the aamchur, salt and red onion. Stir well and continue to cook until the onion has softened – about 3-4 minutes. In addition to being delicious as part of an Indian spread, you could also use this as stuffing for little pastry shells and serve as an appetizer. It is very unexpected and my guests have loved it.